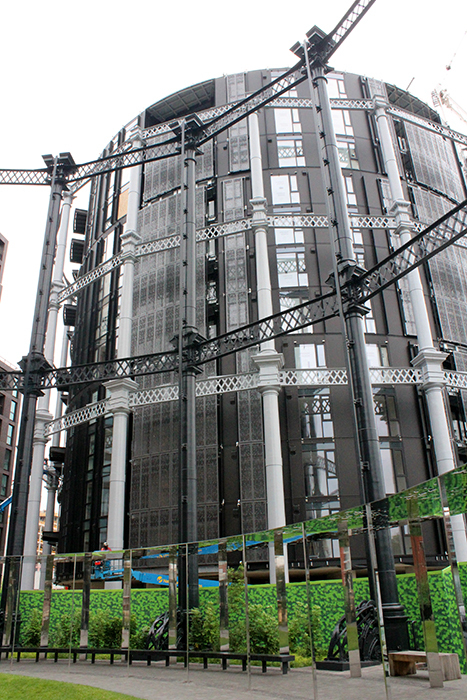 The old Kings Cross gasholders repurposed as high-end apartments in the inner city. With co-authors Dr. Holli Drummond (WKU Sociology) and Dr. John Dizgun (KIIS), Dr. Keeling presented “Assessing Youth Mobility in a Post-Conflict Neighbourhood: Comuna 13, Medellín, Colombia” in a session titled “Mobility, Transport and Making Sustainable Places: a Neglected Nexus” and organized by the Transport Geography Research Group. This interdisciplinary research addressed mobility and violence issues relevant to young people in one of the city’s poorest communities. A more detailed statistical analysis was recently published by the research team in the journal Youth and Society titled “Cross-Group Investigations: Youth Gangs in Medellin, Colombia” (online at http://yas.sagepub.com/content/early/2016/08/17/0044118X16662536.abstract). In addition, Dr. Keeling attended the annual meeting of the Board of Editors of the international Journal of Transport Geography, for which he serves as Associate Editor. While in London, Dr. Keeling continued research on changing urban landscapes, especially in the context of the recent “Brexit” vote and potential implications for infrastructural change in one of the world’s most important financial centers. New transport projects such as the London Crossrail link, as well as the redevelopment or gentrification of old industrial areas represented in the accompanying image, continue to change accessibility and mobility networks in London, enhancing its attractiveness as a global center for services, finance, and insurance.